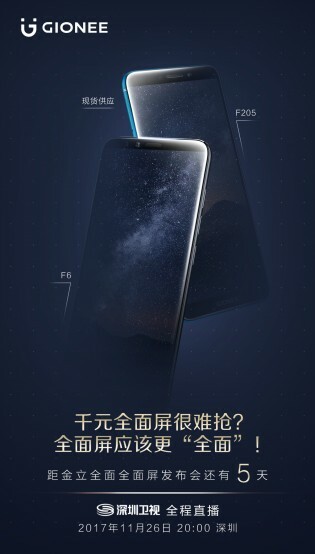 Gionee has a conference scheduled in 5 days in Shenzhen at which it's going to announce multiple bezel-less smartphones and today it's teasing a few of them on Weibo - the Gionee F6 and F205, M7 Plus, S11, S11s and Steel 3. The teasers spare any details outside of the phone names and the fact that they will be "full screen", meaning 18:9 screens with slim bezels. The Gionee F205 reportedly has a 5-inch screen, a MediaTek MT6739 chipset with a quad-core CPU and 2GB of RAM, 16GB of on-board storage, 8MP/5MP back and front cameras and skinned Android 7.1.1 Nougat. 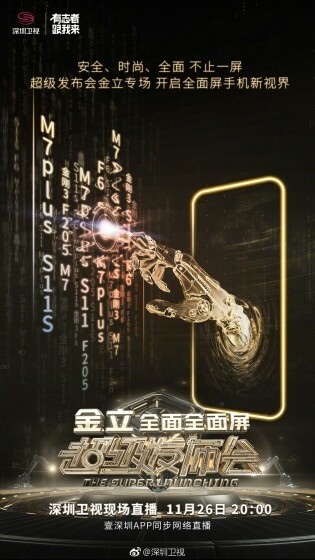 No official specs of the Gionee F6, Steel 3, S11 and S11s have been teased.